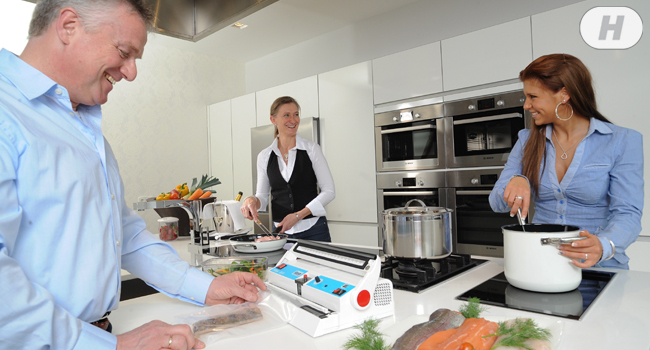 A professional Vacuum Sealer as the central point of the modern kitchen. 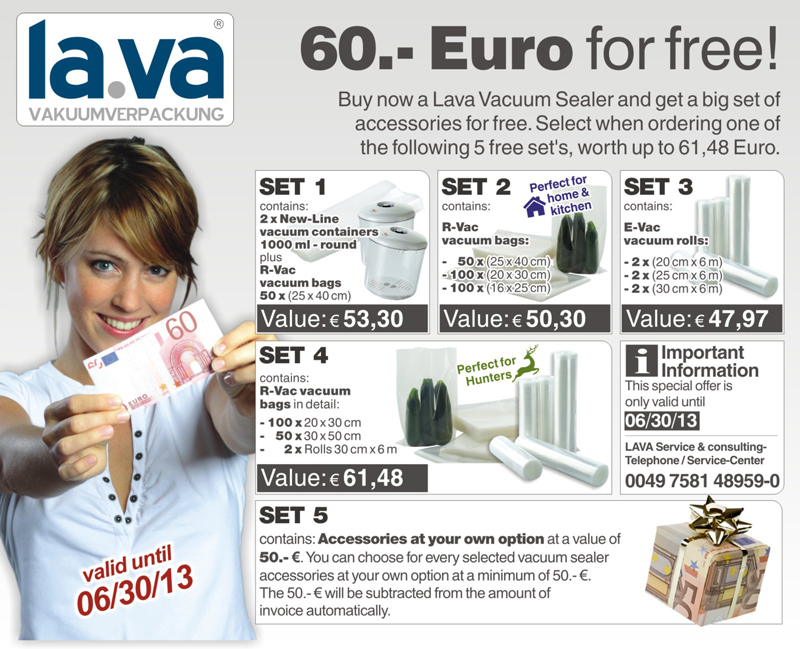 The Original by Lava can be used in so many different ways, as no other Vacuum Sealer can do: Vacuumize and seal Vacuum Bags, any other foils or rolls up to 200µ thickness. 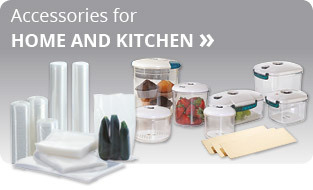 Lava Vacuum Sealers are perfect for Containers, Bottles and Pots, as well as for Vacuum-Packing and preserving jars and Twist-Off Glasses. More information about durability, user tips, as well as application areas can be found here: Vacuumpacking. Vacuum Sealer (sealing by touching a single button) with a bar pressure indication and removable fluid trap. Available with single or as Premium-model with a strong double sealing. Full-Automatic professional Lava Vacuum Sealer with LED pressure indication and a removable fluid trap. The all-automatic entry to vacuum packing. Available with single or as Premium-model with a strong double sealing. The Bestseller! Full-automatic professional Lava Vacuum Sealer with pressure indication by a dial gauge and variable pressure control for soft vacuum. Available with single or extra strong double sealing. Food waste is an environmental killer and the crime scene is the local cuisine. Out of 11 million tons of wasted food, more than half are thrown away in private households. If you want to avoid food waste, should shop conscious first. XXL packages and special offers to tempt you to buy more. If one cannot properly store the goods, throws them away. To make food a longer life, a vacuum sealer is the perfect helper. Even for households. The devices are already available outside the professional price league. 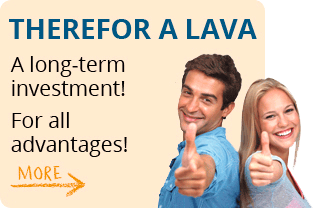 One of the leading brands here is the Lava series from Landig. The South German family relies on self-sustainability and waives anonymous cheap imports from the far east.